Taking Care of Me: Where is my coat? 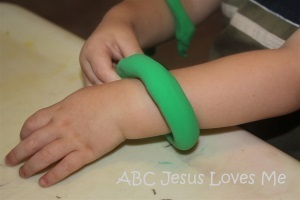 - ABC Book: Help the child draw with glue on the Vine worksheet. Sprinkle glitter over the glue and shake off excess. Let dry. 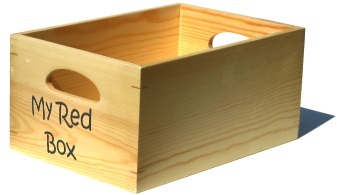 Color Box - Walk through your home or classroom and collect black items to place in a container. For the next nine weeks the child will be doing Shape Walks to learn more about the Shape of the Week. Use pieces of painter’s tape or sidewalk chalk to make a large triangle on the ground. 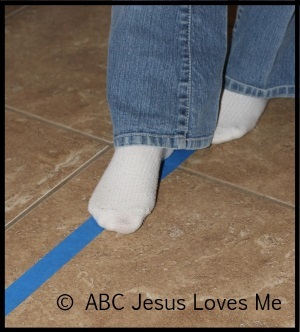 Assist the child in walking, crawling, and hopping around the edges as you sing the shape song. Note: Do not use masking tape on carpet, as it will leave a residue. - On a vertical surface, draw straight lines with a black crayon on the Spider worksheet to create a web. You may need to go over the lines after the child to make them darker. Use black watercolor,to paint the spider worksheet. The watercolor will not cover the web you created with the crayon. - Point and count the legs on a spider. - Find pictures of spiders in the books that you read. - All of the spider webs in the book are raised. Allow the child to feel the raised texture as you read. - Look for spider webs outside. This week demonstrate to the child how to use his/her fingers to squeeze and squish the dough. (Leave the play dough toys for when she is older.) Click to see my favorite play dough recipe. Kick a ball. If your child wants to pick up the ball instead of kick it, walk behind the child and hold his hands. Sign "ball" as you play.